The Katarzyna Mycka Professional Mallet Series was developed to project maximum sound in orchestral and ensemble settings. Each of these weighted mallets is wrapped very tightly with two strands of synthetic yarn. The heads, tightly wrapped in Nylon, provide excellent articulation, while the heavy weight yields an immediate response from the keyboard that is required for ensemble and orchestra playing. This heavier mallet weight brings out the warmth of the marimba by physically activating the fundamental frequencies in the bars. 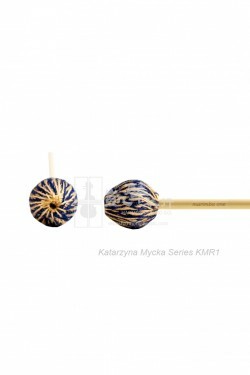 Katarzyna's series consists of seven mallets in varying hardness, available with both birch and rattan handles.